AURORA OUTLOOK: Earth is exiting a solar wind stream that sparked some bright auroras this past week. Geomagnetic activity is subsiding now, but it should renew on Sept. 29th or 30th when another solar wind stream is expected to arrive. SPRAWLING SUNSPOT: Sunspot 464 is wider than fifteen planet Earths lined up in a row, which means it's easy to see. But never look directly at the sun; always practice safe solar observing techniques. Astrophotographer Robert Sandy of Roanoke County, Virginia, took this picture of the sprawling spot on Sept. 27th using a sun-filtered 3 1/2" Questar telescope and an Olympus 4040 digital camera . Above: a movie of growing sunspot 464. Sept. 21-26. Credit: SOHO. ZODIACAL LIGHTS: This is a good time of year for people in the northern hemisphere to look for early-morning Zodiacal Lights. Also known as the "false dawn" because they resemble a hint of sunrise, Zodiacal Lights appear an hour or so before true dawn--a pale luminous triangle jutting upward from the eastern horizon. Canadian Dominic Cantin took this recent picture of Zodiacal Lights side by side with auroras. The two kinds of lights are unrelated. Auroras are caused by geomagnetic storms. 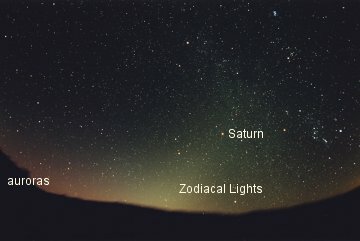 Zodiacal Lights are caused by sunlight-reflecting dust particles adrift among the planets. Early-morning Zodiacal Lights are most easily seen in Sept. and Oct. because those are months when the dusty plane of our solar system pokes over the horizon almost vertically. Look for them on dark mornings after a new moon; rural areas with clear skies offer the best view. PLANETS ALIGN: On Wednesday morning, Sept. 24th, a lovely trio appeared in the eastern sky: Jupiter, the crescent moon and Mercury. Check out these pictures of the event from Steve Irvine of Big Bay, Ontario; from Vic and Jen Winter of Warrensburg, Missouri; from Pal Brlas of Szeged, Hungary; from Chuck Hunt of BrookPark, Ohio; from John Shiflett of Fredericksburg,Virginia; from William Biscorner of Memphis, Michigan; from Steve Poole of Wilson, Wyoming; from Craig Ruff of Boulder, Colorado; from Gianni Tumino of Monte Lauro, Sicily; from Stan Richard of Iowa; from Nick Carbonara of New York City. Did you miss the alignment? Next time get a reminder call from Spaceweather PHONE. You are visitor number 24043924 since January 2000.